I was born in Brooklyn, New York, in 1950. Although I grew up in the city, I spent my summers at my family's homes in Smithtown and Peakville, New York. It was during these summer vacations that I discovered the world of the natural landscape, and it has been the inspiration for my art ever since then. In 1975 I received my MFA in painting from Pratt Institute, and I began exhibiting my paintings at Razor Gallery in SOHO during the late 70’s. From the early 80’s to the mid 90’s I exhibited at the OK Harris Annex located on Broome Street in lower Manhattan. During that time I also exhibited on a regular basis at the Jean Lumbard Gallery located on 57th Street in Manhattan, and at the Clark Whitney Gallery in Lennox, Massachusetts. In addition, my paintings have been exhibited in many galleries and juried exhibitions throughout the US. 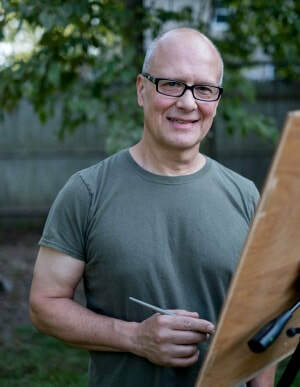 My awards include a National Endowment for the Arts Painting Fellowship, a New York State CAPS fellowship in painting, a grant from the Hillwood Art Museum, Long Island University, C.W. Post College, and numerous awards from juried art exhibitions. Since 1990, I have been on the faculty of St. John’s University in the Department of Art and Design, and served as the department's chairperson from 2010 through 2013.